Remember back in the day when Google was only activating 100,000 Android units a day? You should — it was May. By June, that number had jumped to 160,000 units a day. And today it now stands at 200,000 Android units activated a day. That’s pretty incredible. Google CEO Eric Schmidt revealed as much today during a sit down with a group of journalists after his panel at the Techonomy conference in Lake Tahoe, CA. 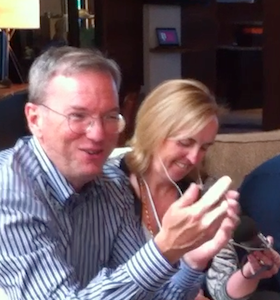 When asked about how the Android platform is doing, Schmidt was practically glowing. He cited the recent quarterly shipment numbers (the ones showing total shipments passed those of the iPhone in the U.S.) and said that he just checked their own internal numbers this morning. Schmidt specifically cited the Droid X as a reason for the recent Android surge. And he noted he was excited about the new Galaxy as well because it’s on all the carriers. When questioned if the revenue coming in from Android was enough to make the whole project worthwhile, Schmidt said that it absolutely was. He noted that the idea behind Android is that it drives search — and that search is still their primary means of revenue. “Trust me that revenue is large enough to pay for all of the Android activities and a whole bunch more,” he noted. He said that they don’t break out Android revenue numbers because they consider it a part of search. Schmidt also quickly transitioned to note that they “love the success of the iPhone” as well thanks to how much it also drives search. Below find the video of him talking about Android.